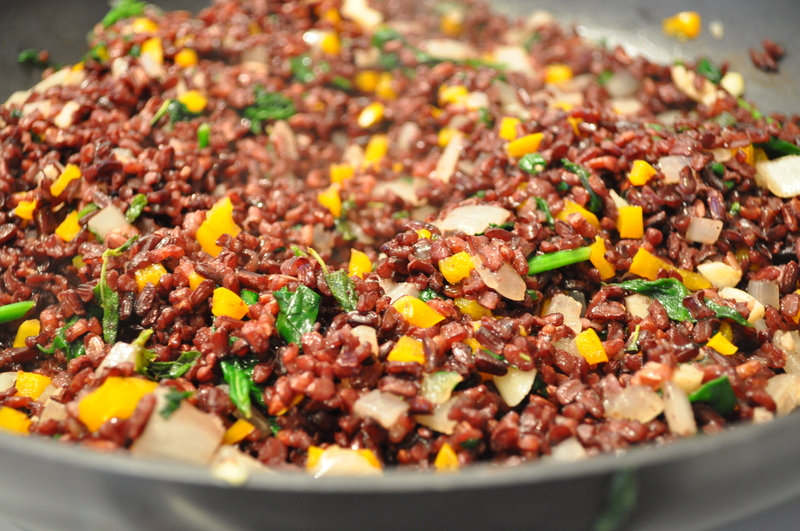 If you haven’t experimented with red or black rice, this is the perfect recipe to do so. For your convenience we’ve included links to some of the harder-to-find ingredients, but if you are a regular at Whole Foods, you should be able to find everything in this recipe at that store. Harris Teeter carries black Japonica. Frozen shelled edamame are widely available but we linked it to Trader Joe’s because that’s the best deal. If you are going gluten-free, make sure the soy sauce you use is gluten-free. This recipe was demoed by Danielle at US Botanic Garden in October 2015. Adapted from “One Bite at a Time” by Rebecca Katz. In a medium pot, bring 4 cups lightly salted water to a boil and add the rice. Turn the heat down to simmer and cook 40-45 minutes until tender. Drain rice and spread it out on a sheet pan to dry and fluff. In another pot, bring 2 cups water to a boil and add a pinch of salt and the edamame. Bring back to a boil and cook one minute. Drain and rinse under cold water; reserve. In a bowl, combine the rice, celery, carrot and scallions. Combine dressing ingredients, whisking well in a small bowl or mini food processor. Toss into rice mixture. Fold in reserved edamame, cashews and herbs. Serves 6-8. This entry was posted in Gluten Free, Recipes from Danielle's pantry, Sides, Vegetarian and tagged cashews, edamame, lime, maple syrup. Bookmark the permalink.